when Spring gives way to Summer. The whole world teems with life and energy, as the increasing warmth and light spurs everything to grow and reproduce while the earth is still moist with the winter rain. 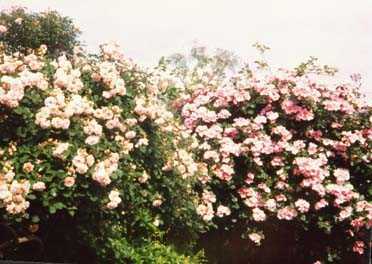 As you can see from the photo, roses in Adelaide are at their very best at this time of year. Those you see are richly scented Felicia, on the left, and Sparrishoop, deeper in colour, with larger single flowers. When I went into the garden on the night of the recent Full Moon the combined perfumes made my senses reel. I planted this combination of rose, honeysuckle, and jasmine so that I could enjoy their perfume, but I never dreamed just how potent it could be until the plants matured. From early spring until mid-summer they literally fill the air with this amazing mixture of scents. And by moonlight the pale flowers seem to be lit from within. I do however, feel saddened each October 31st. when radio, TV, and retailers inundate us, here in the South, with reminders of Hallowe'en - some even go so far as to call it Samhain. Northern Hemisphere Samhain, celebrated on October 31st. and the 2 days following, is a celebration of the start of Winter. Samhain, like the other fire festivals of Beltane, Lammas, and Lughnasad, go back at least 6,000 years, and are seasonal. You can't have a winter festival in summer! The energy is completely opposed to what is being celebrated! Samhain marks the end and the beginning of the Celtic Year, a time " between the worlds"
which resumes with Advent, the weeks of fasting which precede Christmas. by the Church at least synchronised with nature's own calendar. Happily some churches downunder now have seasonal services in addition to those in the official church calendar. But I am constantly amazed and affronted by the way the Northern Hemisphere carries on as though the South didn't exist. The majority of books published which deal with The Wheel of the Year and Seasonal Festivals, including many otherwise good Astrology, Neo-pagan, and Pantheist texts simply ignore it. to the temperate and Polar regions of the Earth. How can we be One Planet if we don't acknowledge the realities of our spherical Earth? We need to be aware of how different the circumstances of people around the can be, so that we can reach a better understanding of those who we are all too often swift to judge. and put Reearthing website update in the subject line.